Nikken's Slim Chuck provides customers with high-gripping torque and excellent run-out accuracy for high-precision drilling and light milling. The Slim Chuck offers performance, accuracy and substantial productivity increases over conventional ER type systems and is available for both standard and high speed applications. Nikken Slim Chucks have a more rigid structure and provide a considerably higher gripping torque than similar competitor products. This is provided by our compact taper and wedge principle; the system adopts an 8 degree collet taper with square shoulder pushing provided from the TiN bearing nut. The result is quite straight forward - the smaller the taper angle, the higher the gripping force and concentricity that can obtained. Our Slim Chuck provides market leading run-out accuracy as standard within 5 microns (by adopting our 'A' or 'P' type collet this is reduced to only 3 microns). 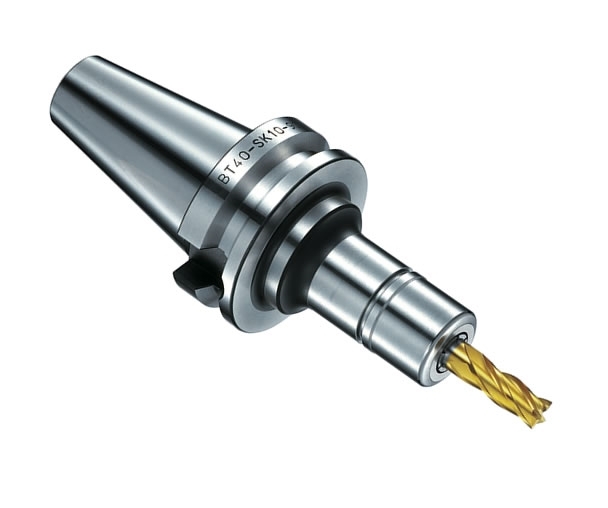 Available as standard on Nikken 2-Lock for both BT and DIN tapers the Slim Chuck also offers the benefits of dual contact for both flange and taper on suitable machine tools (2-Lock is also fully compatible with standard BT/DIN type spindles). 2-Lock increases the contact area considerably from around 44.4mm to 63mm (BT40) and also, as with all our NC tooling products, provides users with over 80% taper contact as standard. Additional standard options of course also include HSK and Nikken Polygon tapers.